Custom made aprons with low minimums and fast turnaround times. Is it possible to have fully custom made aprons shipped in 2 weeks? Yes, when they are American made aprons and vests from Apron Outfitters!! Using tablets or iPad's in your restaurant and need a custom apron pocket? 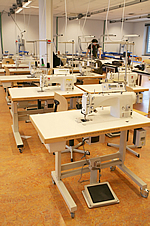 Do you need a wider or longer apron, grommets, rivets or just a pocket added or moved? Would you like a two tone apron or chef coat? All of that is possible with customized apron programs at Apron Outfitters. We have worked with thousands of companies and have taken them from just an idea to a final garment in weeks. 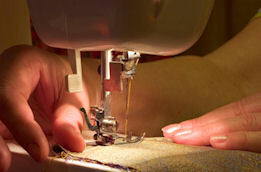 Click for custom apron embroidery or screen printing. Low minimum orders on customs starting at just 40 pieces. Full garment customization; adding/removing pockets, length, width, adjustable/non-adjustable ties and more. Custom aprons make up a large percentage of our business so please don't hesitate to contact us today for a custom apron quote. Q: What is the minimum order for a custom manufactured apron or vest? A: We cut 40 layers of fabric at a time so we have a 40 piece minimum. Q: I need 30,000 pieces and need them fast can you help me out? A: Yes, custom turnaround times start at 14 days but production times change throughout the year so contact us for scheduling your custom made aprons. Q: Can I see my custom apron design prior to production? A: Yes, our pre production samples are affordable and we highly encourage having one made. Contact us for details. Q: I need a custom apron color, can you match my Pantone color? A: Yes, our fabric manufacturer will custom match to your color. Contact us for details. Our custom apron program is another way of keeping the American sewing tradition alive. We simply take pride in our ability to quickly turnaround an item while at the same time producing the finest quality aprons in the world. Its our way of showing the entire global community that American's can still be competitive. If you need that custom made item, give us a shout. We would love to listen to your ideas and bring the whole program together.